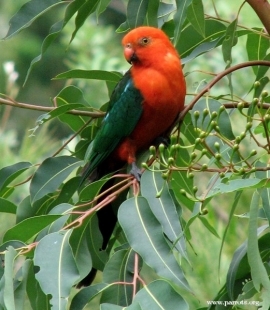 The Australian King Parrot acquires its adult plumage by a slow moult, which begins when the bird is over fifteen months old and is not completed for a further twelve months. A.s. scapularis: Male-red head, neck and underparts; hindneck has blue band; back and wings dark green; wing has silver/green band when folded; blue lower back and rump; tail black tinged with blue. Upper mandible orange/red with black tip, lower mandible black with orange base. Eye yellow. Female-green head and upperparts; red lower breast down to abdomen; silver/green on wing minimal or absent; dark green tail with pink at tip. Bill grey. A.s. minor: Both adults as in scapularis, but smaller in size. A.s. scapularis: As in adult female but lower breast green. Bill dull yellow. Calls in flight are shrill and somewhat loud. When alarmed harsh and metallic shrieking. Males give high-pitched flute-like notes when perched. Fairly common in Australia, less so elsewhere. Small seed mix such as: canary, oats, safflower and a bit of hemp; spray millet; limited sunflower seed, dry, soaked or sprouted; sprouted or cooked beans and pulses; boiled maize; green leaves such as: Swiss chard, lettuce, sowthistle, dandelion, chickweed; vegetables such as: carrot, celery, zucchini, squash, green beans and peas in the pod; fruit such as: apple, pear, banana, cactus fruits, oranges; nuts such as: lightly cracked hazelnuts, pecans and roasted peanuts; complete pellet. Nest box or nesting log. Population may be affected by ongoing habitat loss. A.s. scapularis: SE coast and CE mainland Australia. Occurs up to 1625m (5330 ft). Found in variety of habitats from high forested areas to lower more open spaces. During the breeding season birds are found in more dense forest such as wet sclerophyll forest, gullies, Eucalyptus woodland and savanna woodland bordering with riverine forest. Also, outside of breeding season they are found in cultivated lands, parks, orchards and sometimes gardens. Eats fruits, flowers, berries, nuts, seeds, insect larvae, buds and other vegetation. A favourite is mistletoe Viscum album. May take some crops. Are seasonally nomadic to a degree. Usually found in pairs or small groups, or post-breeding flocks of up to 50 individuals. Conspicuous when not feeding; when eating wary and quiet. Gather in groups to feed in morning, then sit quietly through the heat of the day, becoming active again in late afternoon.